McKenna’s painting subjects are widely diverse. With the emphasis on landscapes, “I simply paint what interests me.” He paints exclusively in oils creating an impressionistic style with texture and loose brushwork. His paintings elicit a sense of warmth and calmness, an open invitation to explore and all share the inherent ingredient of the infusion of sunlight. With relatives residing on both the west and east coasts, the family road trips from Kansas covered a lot of territory. The desert landscape, canyons and colors of the southwest were especially appealing to him when covering the miles to California. His travels continued throughout the United States while working as an accomplished musician. His contribution to music has been recognized with the induction into both the Kansas Music Hall of Fame and the South Dakota Rock & Roll Music Hall of Fame. In 2017 McKenna was commissioned by the Friends of the Capitol along with the Oklahoma Arts Council and the Office of the Governor of the State of Oklahoma with an art installation for spring of 2018 honoring the centennial of the Oklahoma State Capitol building. McKenna’s exhibits have included Masters of the American West, Autry National Center in Los Angeles, Ca; Small Works Great Wonders, National Cowboy & Western Heritage Museum, Oklahoma City, OK; Collectors Reserve, Gilcrease Museum, Tulsa, OK; Night of Artists, Briscoe Western Art Museum, San Antonio, TX. 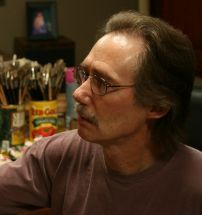 His work has been published in Art of the West, Southwest Art, and Western Art Collector.